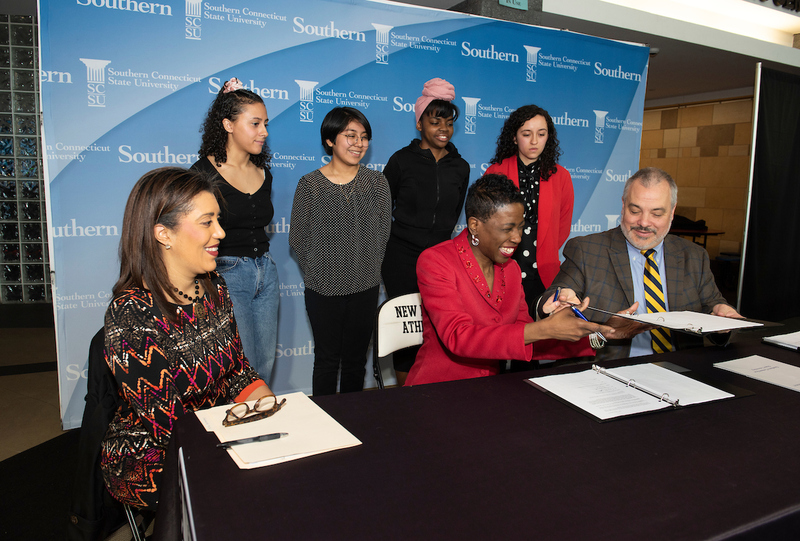 A greater number of outstanding New Haven high school students will have access to college-level classes, thanks to an agreement announced today between Southern and the New Haven Public Schools. The university already offers tuition-free college classes to a small group of excellent high school students willing to come to the SCSU campus. Most of the 60 or so such students are from New Haven and the immediate surrounding communities. But for the first time, Southern is offering the option of taking those college classes at the city’s various high school campuses. Those classes will be taught by SCSU faculty or high school teachers who meet specific criteria and are hired as SCSU adjunct faculty members. Terricita Sass, SCSU associate vice president for enrollment management, agreed. Birks said she is excited about the potential academic and financial benefits to students. SCSU student Dayana Lituma, who graduated from Wilbur Cross High School in 2017, said taking college courses in high school helped her tremendously. She took five such courses, including three at Southern. As a result of the credits earned, she plans to graduate after the fall semester of 2020, a semester earlier than the traditional four-year college experience. “Not only will I be able to save money on tuition, but the college classes helped me figure out early on what direction I wanted to pursue,” she said. She plans to seek a master’s degree in speech-language pathology, and eventually become a bilingual speech-language pathologist. *Southern has created a Residential Leadership Scholarship that provides a small group of students with free on-campus housing. The students must meet the criteria for the New Haven Promise Scholarship program, as well as write an additional essay and provide a letter of recommendation to be eligible. If selected, the students must complete activities in leadership development, community contribution/campus involvement, academic enhancement, mentoring and activism/civic engagement. Last fall, seven students were chosen for the one-year scholarship. Next fall, five of those seven students will be offered a continuation of the scholarship, while five additional New Haven graduates will receive the scholarship. *Southern will set aside $100,000 in merit-based aid, and $100,000 in need-based aid, to incoming freshmen next fall who graduate from New Haven schools. The allocation is expected to continue each year. *SCSU social work students will work with the New Haven Housing Authority (Elm City Communities) to assist students and their families with truancy, financial literacy, online applications and other matters. The housing authority has allocated $25,000 for the program, which calls for six students to collaborate with resident managers in the West Rock community. The program is scheduled to begin next fall. *The university plans to increase its presence at local middle and high schools, particularly in the Newhallville section of the city. This will include workshops, participation in field days and other similar types of events. It is part of a community collaborative effort that also involves local businesses, clergy and other neighborhood leaders. *Southern launched a Visiting Scholars program last semester, in which SCSU faculty members teach academic lessons to area K-12 students. Many of these visits are to New Haven schools. The program offers hands-on learning experiences, giving them deeper insight into various disciplines. The lessons are designed to align with the classroom curriculum. *SCSU plans to host a career exposure day in May for Common Ground High School. The university will organize panel discussions on public health and recreation, tourism and sports management. In addition, CARE (Community Alliance for Research and Engagement), a program co-housed at SCSU, has been helping Common Ground redesign its 10th grade health curriculum.